Everybody sees themselves as elegant and regal from time to time, with the perfect pout and curly mane that belong to the king of the forest. But even the bravest of us also gets a little discouraged sometimes! Maybe that's why generations of audiences have connected with the Cowardly Lion from The Wizard of Oz, who embodies the back-and-forth struggle that so many people experience as they're growing into their own magnificent skin! Or maybe it's the growling, purring fun of his show-stopping songs. We're not even sure that lions make all of those noises, but the Cowardly Lion makes us yearn for a world in which they do! Then again, we could be jealous that he's the only one to receive a medal from the Wizard himself! Not that we would be ungrateful for a heart-shaped ticker, a homework-free diploma, or a trip in a hot air balloon. Then again, you and your gang might just be looking for a great group costume that celebrates your shared love of iconic cinema and perhaps the greatest American fairy tale ever told. After all, Dorothy and her pals are a much more cheerful bunch than the Wicked Witch of the West and her evil army of flying monkeys! 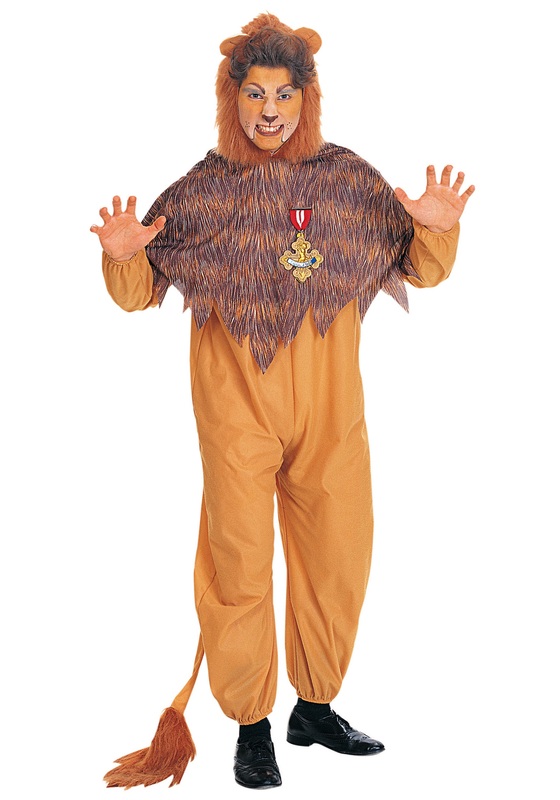 No matter what drew you to this Adult Cowardly Lion Costume, or what rewards you might hope it will bring, we're sure you'll enjoy taking up the furry mantle of a true leonine legend when you cloak yourself in this officially licensed jumpsuit and headpiece.